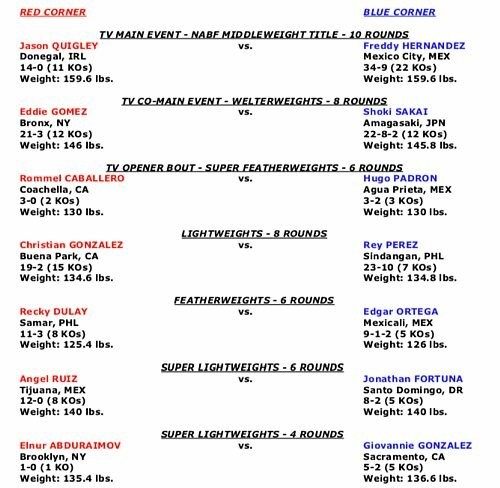 Quigley vs. Hernandez is a 10-round fight for the NABF Middleweight Title presented by Golden Boy Promotions. The event is sponsored by Tecate, "THE OFFICIAL BEER OF BOXING" and Hennessy, "Never Stop, Never Settle." The fights will take place on Thursday, Oct. 18, 2018 at Fantasy Springs Resort Casino. Doors to the event open at 4:30 p.m. PT, and the first fight begins at 5:30 p.m. PT. ESPN2 and ESPN Deportes will air the fights beginning at 10:00 p.m. ET/7:00 p.m. PT, and stream live on ESPN3 starting at 8:30 p.m. ET/5:30 p.m. PT.